Component Video to HDTV Converter + Audio is a Plug and Play device for displaying Digital and Analog Component Y/CbCr/PbPr video to your High Definition Television. This new product range connects your Component output ports from your DVD player, Set Top Box or other Component enabled devices for conversion to HDMI 1.2 protocol output to your HDTV or monitor. A new and uncomplicated converter for use in Professional applications and Private Home Theatre systems. 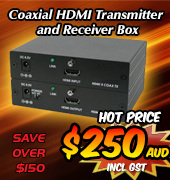 Designed for connecting non-HDMI output devices to High definition TV's and monitors. Simply insert the colour-coded Green, Red and Blue Component cable plugs to your Digital or Analog DVD, Set Top Box or Playstation Component output sockets, then connect the HDMI output of the Component Video to HDTV Converter + Audio to the HDMI input of your HDTV or monitor. 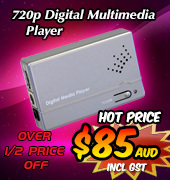 This converter supports High Definition resolutions from 480p and 480i right through to 1080p and 1080i. Input resolution equals output resolution. Separate Digital and Analog Audio input is supported for combining with the HDMI output signal. Connect the Co-axial Digital Stereo or Analog Left/Right audio outputs of your playback device to the corresponding Co-axial or L/R inputs of the Component Video to HDTV Converter + Audio and the converter combines this with the HDMI output signal to your HDTV. The Audio input is switch selectable on the converter. The Component Video to HDTV Converter + Audio is powered by a 5vDc power supply with a red LCD indicator to show power on. A compact, light weight and stylish design, all connection ports are clearly labeled and and easily accessible. 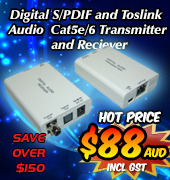 Highly efficient for simple Digital and Analog Component output devices to interface to HDMI HDTV's and monitors. Fully HDMI 1.2, HDCP 1.1 and DVI 1.0 compliant, you can even use a HDMI to DVI adaptor cable for connection to DVI input HDTV's and monitors. For more information about the Component Video to HDTV Converter + Audio please enter here or you can contact our Sales team for extra assistance.